“We are flying the F-35 all over the Middle East, and have already attacked twice on two different fronts”. General Amikam Norkin, Commander of the Israeli Air Force, made this announcement on 22 May at the conference on aerial superiority at Herzliya (a suburb of Tel Aviv), with the participation of the Air Force chiefs of staff from 20 countries, including Italy. The general did not specify where the F-35’s had been used, but he hinted that one of the attacks was carried out in Syria. He also showed images of Israeli F-35’s flying over Beirut and Lebanon, but they have almost certainly also been used for non-attack missions in Iran. Israel, one of the 12 “global partners” of the F-35 program led by US Lockheed Martin, was the first to buy the new fifth-generation fighter, which it renamed “Adir” (Powerful). So far, Israel has received nine of the 50 F-35’s ordered, all model A (conventional take-off and landing), and it is likely to purchase 75. This is a realistic goal, given that Israel receives about 4 billion dollars annually in military aid from the United States. The training of the first Israeli F-35 pilots began in July 2016, at Luke air base in Arizona. After having attended a three-month course in the USA, in order to be certified as operational, they have to complete several months of training for “real flight” in Israel. Approximately 30 F-35 Israeli pilots have been trained so far. On December 6, 2017, the Israeli Air Force declared its first F-35 fleet fully operational. Israel’s military industry also participates in the F-35 programme. Israel Aerospace Industries produces wings for the F-35A; Elbit Systems-Cyclone produces fuselage components for the F-35; and Elbit Systems Ltd. are developing the Generation III helmet-mounted display system, which all F-35 fleet pilots will wear. General Norkin’s announcement that the F-35 is finally “combat proven” therefore has the primary practical effect of boosting the F-35 programme, which has already encountered numerous technical problems and needs continual costly upgrades which increase the already enormous cost of the programme. The fighter’s software has been modified over 30 times and requires further updates. General Norkin’s announcement was therefore particularly appreciated by Lockheed Martin’s Chief Executive Officer, Marillyn Hewson, one of the speakers at the conference on “aerial superiority”. 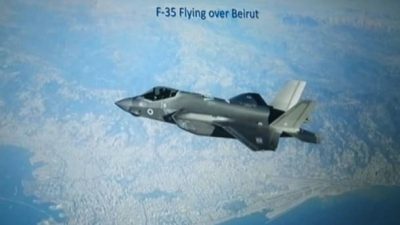 The announcement that Israel has already used the F-35s in “real war” operations serves at the same time as a warning to Iran. The F-35A’s supplied to Israel are designed primarily for the use of nuclear weapons, in particular the new B61-12 precision-guided bomb. The B61-12, now in its final stages of development, will be deployed by the United States in Italy and other European countries. It will almost certainly also be supplied to Israel, the only nuclear power in the Middle East, whose arsenal is estimated at 100-400 nuclear weapons. Israeli nuclear forces are integrated into the NATO electronic system, as part of the “Individual Cooperation Program” with Israel, a country which has a permanent mission at NATO headquarters in Brussels, although it is not a member of the Alliance. Italy, Germany, France, Greece and Poland participated with the USA in Blue Flag 2017, the largest international aerial warfare exercise in Israel’s history, in which nuclear attack tests were also carried out.